WEIRTON — There have been a lot of changes in Weirton in recent years, and after this week more will have seen it for themselves. A Regional Economic Diversification Summit, sponsored by the U.S. Economic Development Administration, kicked off Monday and will continue today, drawing together local, state and federal officials, as well as business and development representatives, to discuss the community’s past, present and future. “This is an exciting day,” Patrick Ford, executive director of the Business Development Corp. of the Northern Panhandle, noted, explaining representatives of several federal funding agencies were participating in this week’s summit. Monday’s activities included a welcome reception at the Fairfield Inn and Suites, followed by a guided tour of three areas in the city currently the focus for economic development: the Three Springs Business Park; downtown Weirton and the former steel-making properties now owned by the Frontier Group of Companies. Weirton City Manager Joe DiBartolomeo said the summit comes at an important time for the city, as federal agencies such as the Environmental Protection Agency and the EDA can get a better idea of the goals of local officials. He said there is a mix of possible projects being discussed, with everything from residential and retail to light industrial seen as possible. “We’re trying to rebuilt the city to make it more attractive,” DiBartolomeo said, adding new jobs will draw more people and more businesses. Today, participants will gather at Williams Golf and Country Club for a series of roundtable discussions, focused on economic development, transportation and workforce development. “We’re breaking down the challenges,” Ford said. 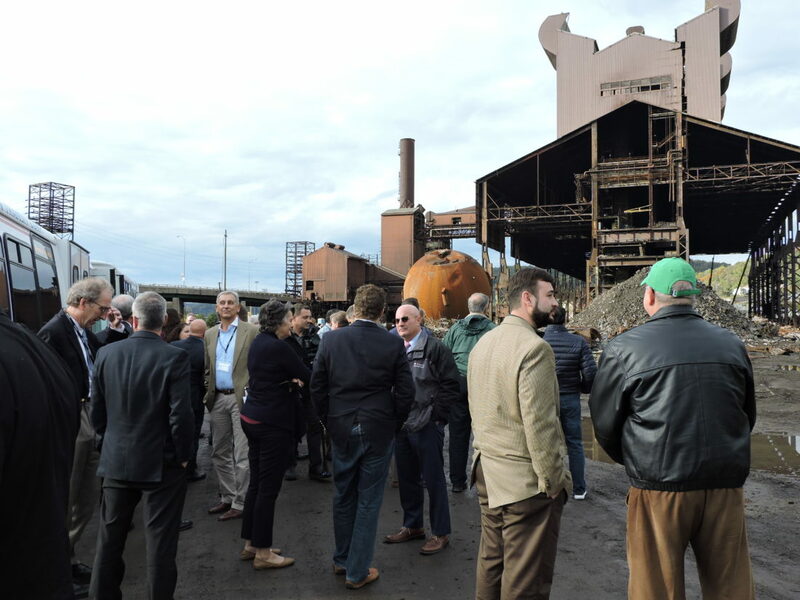 Among those in town for the summit is Craig Slater, vice president and general counsel for the Frontier Group of Companies, which purchased approximately 1,200 acres from ArcelorMittal last year, and is in the process of demolishing and marking much of the land. Slater pointed to the opening of Bidell Gas Compression as an example of what is possible in Weirton, saying it was shovel-ready and made possible through cooperative efforts of local, state and federal government agencies working with the BDC, Frontier and others. “This summit will bring that energy and those funds here,” Slater said. Slater extended his appreciation to the BDC and the City of Weirton for their continuing efforts to grow the community. Dan Motley, of Norfolk Southern, applauded the efforts of the summit as an indication of more cooperative efforts, which he said can only lead to good things for everyone involved. Weirton Mayor Harold Miller said plans for the summit began six to eight months ago, with a visit by city officials to Washington, D.C. He and other officials noted Weirton has been able to bring about higher returns to public funding than other communities, attracting $35 of private investment for every $1 of public investment. “Our success to this point really encouraged them to come to Weirton,” Miller said.